The New Beach Bar also known as The Long Bar in recent years was a separate live band entertainment venue situated on the ground floor of the New Beach Hotel, (formerly The Queens Hotel) in Great Yarmouth located on the seafront on the corner of Marine Parade and Regent Road on what they call Great Yarmouth's golden mile. The New Beach Bar was a lively place bustling with people during the heyday's of the 1960's and 1970's, where live bands were appearing seven days and nights a week throughout the summer seasons. The first time I played the venue I recall was back in the year 1972, at the tail end of the summer when I was asked to deputize for the drummer of a local band called The New Princely Sound, by my friend Colin Dyble the bands guitarist. Colin who at the time lived in Caister on sea, often asked me from time to time if I would sit in with the band when their regular drummer at the time Colin Burrage was indisposed taking time out. It was a great gig as always and the place was packed to the rafters. The New Beach Bar was a long room with one of the longest bars on the east coast on one side and huge windows with a seafront view on the other. The venue also seemed to have a no dancing policy at the time, which made it more of a concert type venue than a venue which enticed the natives to leap about all over the place. I returned to play the venue several times when in 1975, I played a full lunch-time summer season residency at the New Beach Bar starting with one band and continuing with another. I began the residency with guitarist/vocalist Pete Yarwood and bass player Dave Saggers both from the Lowestoft area along with myself Joe Harlow on drums. Pete and Dave formerly played together in a band called Rainbow Lake which included female vocalist Michele Breeze, daughter of singer Alan Breeze who appeared regular on the iconic 1960's TV variety programme The Billy Cotton Band Show. The gig at the New Beach Bar went well but after a few weeks because of other commitments Pete and Dave decided to leave which left me seeking other musicians, when I was joined by my very good friend bass player/vocalist Max Bedford and guitarist Paul Seago. Paul was a fine player who at the time lived in Caister on sea, while Max was originally from the London area who formerly played with The Treble Tones backing singer Helen Shapiro. 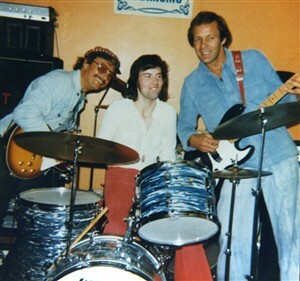 Paul only stayed for the gig a short while so Max suggested guitarist Pete Carter for the gig who was in the area for the summer season playing alongside Max in the evenings at The Wellington Pier Theatre, backing The Dickie Henderson Show. Pete was a wonderful player who came from the Peterborough area in Cambridgeshire, and backed many summer season shows in Great Yarmouth over the years as well as backing many well known names including Jet Harris, Cliff Richard and The Shadows and Emile Ford and The Checkmates along with having spent time performing with 1960's favourites The Bachelors for many years. For the lunch-time gig at the New Beach Bar, we played music ranging from middle of the road to standards and jazz. The place was always full especially at weekends when the holidaymakers arrived in town. A humorous sight we witnessed during the season of 1975, was when we were graced with the presence of this lush who staggered in on a regular basis ordered his beverage and parked his arse on the nearest available seat. After he was well tanked up he then staggered towards the bar twirled around a couple of times and preceded to dance, when Max introduced this flaky character as Fred Astaire our afternoon cabaret to the amusement of everyone there. We had a wonderful season playing the New Beach Bar whereby myself Max and Pete returned to play the venue once again the following year in 1976, for another lunch-time summer season residency which also went very well. I also played occasional gigs with other local bands at the New Beach Bar, including Hugo McGill and The Willhire Medicine Band fronted by Irishman Hugo McGill with whom I recall playing a duo gig at the same venue. The Cheverons (formerly Rock Of Ages) were also another local band I played the New Beach with along with one of my early bands Wishing Well. Other local bands I got to see play the venue during the same period were System and vintage Rock 'n' Roll band Memphis Index. There was also a smaller lounge bar on the ground floor of the New Beach Hotel, situated on the Regent Road side of the venue where local bands also played along with old style entertainer Artie Lind, who I saw playing the venue in the corner lounge bar with his Party with Artie act entertaining holidaymakers and locals alike. Great times and great days playing the New Beach back in the day. This page was added by Colin Stott on 06/05/2016.